Although it may seem like there’s been no creating going on here lately, I have been doing at least a little bit. 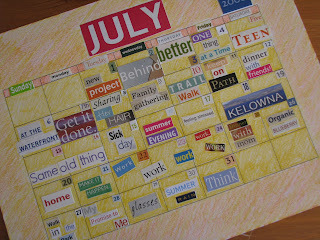 Inspired by the book Journal Revolution, Child Two and I made calendar journals in July. 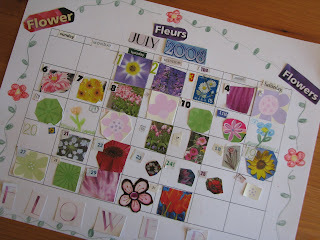 Her theme was flowers; every day she found or drew a picture of a flower. I used words cut from magazines and junk mail to make a note about my day. As I mentioned in a post on Always an Editor, doing this calendar journal helped me notice that I spend quite a lot of my time in rather serious pursuits, so I’m paying more attention to doing something fun or relaxing every day. 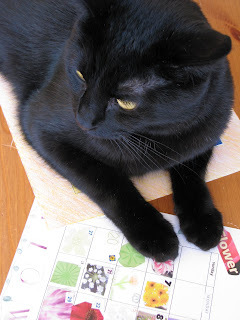 The calendars themselves were a lot of fun to make and, apparently, they also make a fine place to rest. I’m using my August calendar to remind me of one of the items on my list of things I’d like to be doing. I studied French for many years in school, and although I’ve never been truly fluent, I could understand it and make myself understood pretty well, and it was always one of my favorite subjects. (I am such a language dork that I actually love doing grammar exercises. Is that sad?) I'd really like to improve my French again; I'm determined to go to France one day, even if I'm 85 and tottering around with two canes by the time I get there. So this month I am reading something in French and recording one new-to-me word on my calendar journal every day. I spent much of last weekend working on lined curtains for Child One’s room. 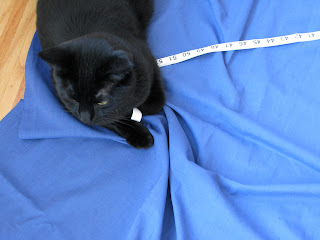 I’ve had the fabric for ages (where ages = years), but for some reason I was hesitant to get going on them. I’m not sure why I was intimidated, considering I’ve made curtains lots of time and Child One is not one to demand perfection (or to even notice imperfection, for that matter). Part of the problem was not having a place to spread everything out, but now that that’s been solved, I’ve decided that I must get them done because I won’t settle down to any other sewing projects until I do. I’ll be too busy over the next two weekends to work on them, but given how long he’s been waiting, a couple of weeks more is nothing. 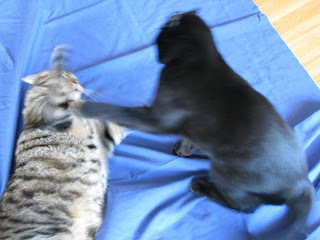 although I’m sorry to report that there were some arguments over whose turn it was to guard the fabric. I had hoped to spend a lot more time being creative this summer, but instead I’ve made major progress in my work and much-needed changes to how I run my business. It hasn’t been the lazy, freewheeling summer I’d hoped for, but the result is a much more manageable workload. If I stick to these changes, I won’t be working nights and weekends regularly and my stress level will drop, so in the long term I will get the creative time and energy I crave. I love the calendar idea. French, eh? I am a Spanish gal. Last night at Farmer's Market we were drumming up publicity for Battin' for Boobies. I approached a French couple to give them a flyer. I am sorry to say that I don't even know how to say "boobies", or anything resembling it, in French. My hand gestures scared them off. I don't think they will be joining us for the game tonight. Did Jamie win exalted ruler of the curtains? I really love the calendar idea. I think I'm gonna tell my daughter about that. I'm wondering if she can do something with it for her students...hum, teaches 5th grade. Very cleaver idea. Her flower one turned out quite cute! lol.......the cat/cats sitting on everything, soooooooo true of their nature. Glad to hear your stress level is better, and hope your new plan works out well for you. Stopping back in to see how you're doing. Haven't heard from you. Hoping things are going well for you. Still need to chat with my daughter to explain the calendar idea to her.